Driving up to Le Potager d’un curieux, the first thing you see is a giant pile of stones crowned by an old television set – the first indication that perhaps this garden is a bit more than a few tomato plants and a rose bush or two. Once you meet the owner, Jean-Luc Danneyrolles, the television set starts to make a bit more sense – there is no doubt that you are in the company of a man who marches to the beat of his own drummer. Le Potager d’un curieux, in the Provençal countryside near Apt, is an extraordinary place – intriguing, disconcerting, inspiring – reflecting the personality of its owner. Jean-Luc has a freedom, even wildness, in his spirit that comes out through his garden and they are in perfect sync. Potager means kitchen or vegetable garden and Jean-Luc has, over the past 20-some years, created a place where ancient or forgotten plant varieties are resurrected, nurtured and encouraged to flourish in soil that hasn’t seen a drop of chemical pesticides or fertilisers. When asked what he uses to ward off disease in his crops, his look is almost blank, as if he doesn’t understand the question. ‘Rien,’ he shrugs. ‘Nothing’. He believes that trying to prevent or cure his plants’ diseases weakens them and makes them fragile so they have to fight the disease themselves, just like in the wild – a French gardener’s equivalent of tough love. The fact that his seemingly endless acres of crops are flourishing makes me think he’s on to something. When we visited him, one of his students was stirring a bubbling pot of the latest crop of strawberries on an old stove in his workshop (he was making jam). All around the place are great chandeliers of dried plants, surreal mobiles made of hollowed-out gourds and cages filled with long fingers of desiccated beanpods. The doors are collaged with newspaper photographs and headlines with writing scribbled and painted over them. Throughout the grounds, strange sculptures are half hidden as the vegetation embrace them, giving them an almost subliminal quality. It’s only once you’ve walked past them that they creep into your peripheral vision. Handwritten plant plaques to identify the beds are solid wooden squares painted in cobalt blues, fire-engine reds, lemon yellows, splashing primary colours throughout the spring planting and gently weathering to more subtle shades as the plants grow and paint the garden from their own palette. 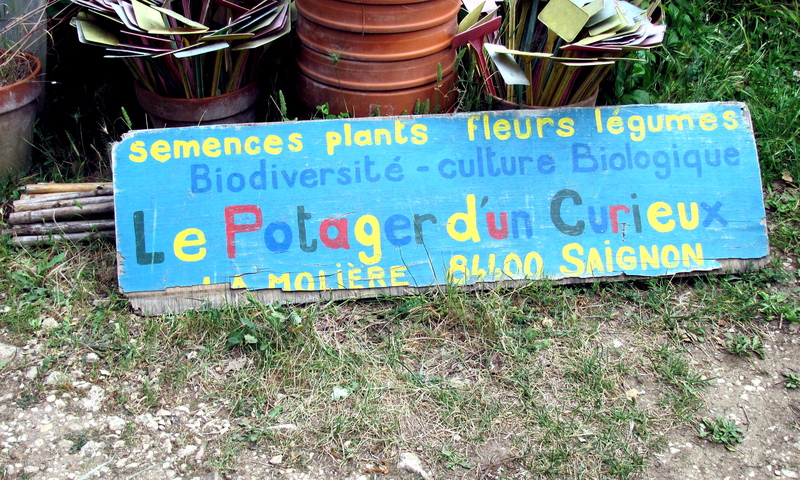 Le Potager d’un curieux, La Moliere, 84400 Saignon. Tel: 33 (0)4.90.74.44.68; lepotager@wanadoo.fr. Visitors are welcome during the summer months. Plants and seeds are also for sale. To see some pictures of our visit to Le Potager d’un curieux, go to the cottages4you Facebook page. Kathi Hall is the editor of Escape magazine for cottages4you. She loves travelling and being surprised by what she finds, she’s a fluent French speaker in her head but strangely mute when confronted with an opportunity to speak it out loud and she firmly believes in trying all local specialities – except for snails.